Posted by thegulfblog.com in Middle East, Random. 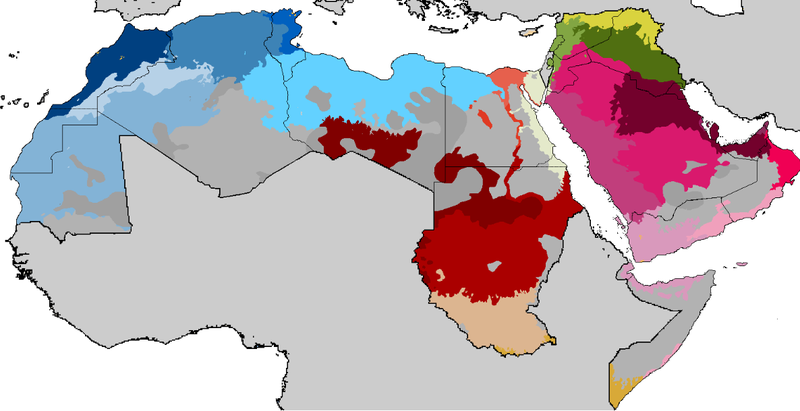 Here’s a fascinating map of the various Arabic dialects found throughout the Middle East. Being far from an expert or even someone overly proficient at Arabic I’ll just make two quick comments. 1) It must not be forgotten that this map does not at all account for the differences in Arabic. Whilst, for example, Iraqi and Gulf Arabic might not be that dissimilar, Gulf and Moroccan Arabic are, I believe, hugely and almost incomprehensibly different. 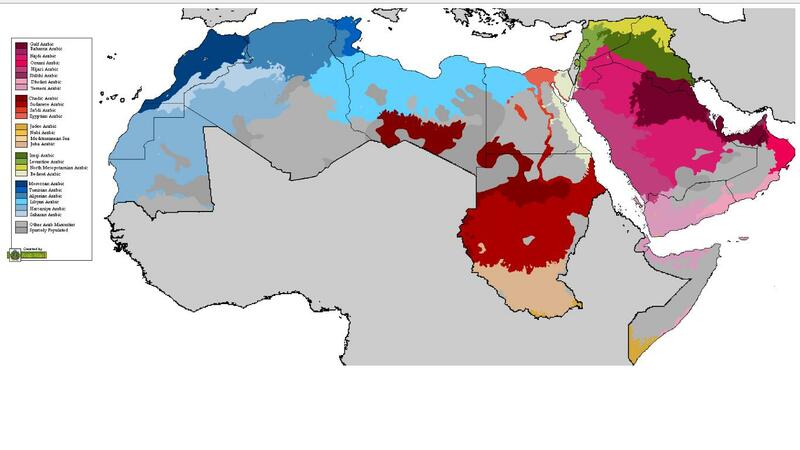 2) This map also significantly underestimates the importance, spread and general dissemination of Egyptian Arabic. Whilst the map shows that this dialect is spoken only along the Nile and in its delta, Egyptian Arabic is, so to speak, the lingua franca/arabica of the Arabic speaking world and will be understood essentially everywhere. This is due to the profusion and ubiquity of Egyptian media (notably films and music) throughout the latter half of the 20th century. Though to some degree this is changing today, with Lebanese film and music coming to the fore, Egyptian Arabic is still entrenched and widely understood. i dont agree that egyptian arabic is the lingua franca of the arab world. it may be understood by almost all arab speakers but definitely not spoken among them. classical arabic still retains that status in that almost all will understand it and be able to converse – possibly crudely – with others. they would probably talk in egyptian arabic, or a “classicised” version of the their regional/local dialect. The fact is when 2 distant Arabs meet(their native dialect is incomprehensible to the other), both automatically switch to ‘Egyptian Mode’. When any Arab meets an Egyptian, regardless of where they are, that Arab will choose the Egyptian dialect instead of their native, even if their native is understood by the Egyptian, like Palestinian or Syrian. So in reality, Egyptian dialect is the universal lingua for Arabs and I don’t believe this will change soon if ever, even with the rise of pop culture from other countries. I imagine that two distant Arabs may just use a few Egyptian inflections, verbs and so on. ‘Ruh’ (if they don’t use that in any case) instead of ‘th-a-b’ and an ‘izayak’ for a ‘shlonek’ or something like that. Though I stand to be corrected. -One has to acknowledge that Egyptian Arabic is not as universally understood as one might think, there’s an age factor. Many Arabs above age 40 cannot easily understand it as they grew up before the age of TV. I was wondering, do you have a higher res version of this, I’d like to add it to the collection on my site. Sorry..what you see is what you get. Last time I checked, northern Iraq spoke Kurdish, not “Mesopotamian Arabic” as goes with the eastern Syrian-Iraqi Border. I’m in an Arabic class right now, they teach formal (Quranic), Shami, and Masri – the teacher discourages us from using classical too much and tells us to focus more on Egyptian. So I think Egyptian is indeed the lingua franca. Arabs in northern Iraq speak Mesopotamian or Masawi dialect. Kurdish may be more widely used there, but that is not to say Arabic doesn’t exist. Nobody switches into Egyptian Arabic to understand each other, that’s just crazy talk. It is much more likely that Arabs will switch to MSA, if the vocabulary is very different. Even then, you laugh at each other because speaking MSA, just sounds strange in normal conversation. Someone here said that the vocab of Moroccan and Gulf Arabic is most similar??? Maybe for Moroccans that have lived in the Gulf for years and years. Otherwise, there is a serious split in vocabulary from East to West… the divide coming somewhere in the Libyan desert. This map is interesting and I would really like to see the research that backs it up. I am a Qatari and have spoken to Moroccans in Morocco and Qatar and no alternative dialect was necessary , the only accent that is impossible for me to understand as a Qatari is Algerian. Hey guys thanks for making this clear as mud….